we’re still waiting for snow and the temperature is annoyingly high, but december is just around the corner and it really is time to wear those woolies now. i’ve been knitting quite a lot, but i haven’t finished anything since my last pair of mittens. stefan is in desperate need for a new pair of mittens too, since the fair isle gloves i knitted for him five years ago (was it really five years ago? that’s crazy!) are very worn. not beyond repair, but i’ve mended them so many times by now i’m actually rather sick of them. more fun to knit a new pair. the sauage mittens are for him. he loves sausages, so i find these very suitable! the pattern is by spillyjane (ravelry link) and i bought it at her ravelry store. i’m using a lovely, tweedy yarn called shetland 4-ply from a company called harris tweed textiles, but it’s made by carloway mills on the isle of lewis. a bit confusing but it’s still a very nice yarn. i bought many years ago from my friend tove, who in turn had bought it online, i don’t know from where. 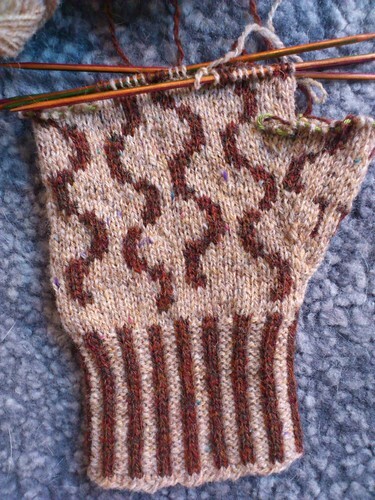 i’m making some modifications, adding thumb gusset, making them fingerless gloves with a top flap. for easy access to the display on stefans iphone, of course. i’ve also begun a new hart for myself. 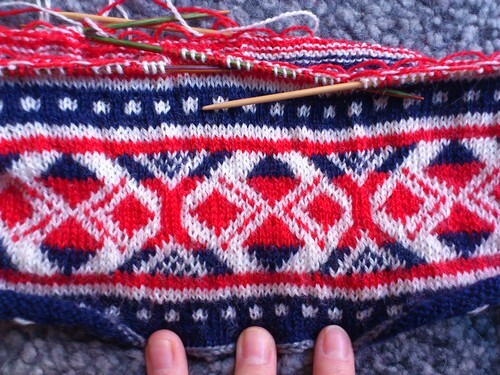 this project was initiated at my class at hv-skolan where we last time explored the knitting traditions from halland. the colours are very intense and i would never wear any of them seperately in any garment, but combining them like this i rather like it. the yarn is huldra, from hifa, a yarn from norway. it’s incredibly soft and nice to work with. but not soft in a “bad” way, not like merino, it still feels very wooly. just not as scratchy as the yarns i tend to use normally. i know i’ll use this yarn for many other projects. socks, perhaps? if one reinforces the heels and toes, it might work just fine. it certainly is fine enough. i’ve also made some progress on my manu cardigan, i actually enjoy plain stocking stitch a lot. especially when working on other patterned projects at the same time, it’s good to have different things to alternate between. i can knit on my cardigan on the bus without having to check the pattern. instead if the provisional cast on, i made a crocheted cast on. 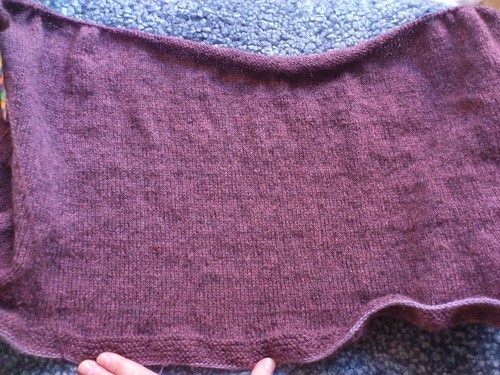 the garter stitch egde is very floppy and loose, and i wonder if i should have used a smaller size needle. i love the yarn, this was also bought from a friend, karin, who had purchased it from a yarn shop in stockholm which is now closed, gunga din. it’s a rather scratchy, plied wool yarn in a colour that is almost impossible to catch on camera. it looks different all the time, mainly depending on the light. it’s actually a warm heathery purple-pink, but it mostly looks like ground meat when photographed. or a much deeper and colder purple as in the photo above. anyway, i’ve heard that the yarn sold at gunga din was in fact from morjärv woolen mill (sadly closed now) but that the shop proprietor changed the labels on the yarn she sold… i don’t know if it’s true, but i’ve compared it with other morjäv yarns and similarity is striking. i’m at home today, not because i’m ill or anything, but because i have a two-day vacation! what’s the occasion? we have a new family member! meet vincent! 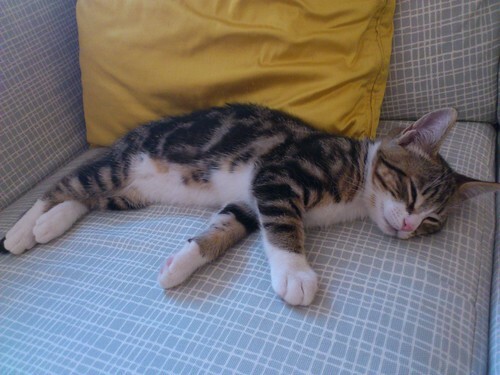 this wonderful little kitten moved in with us two days ago, and now i’m staying at home for two days (stefan will be at home the rest of the week) to make sure that he gets on alright and espacially to see how he and laban are getting on. there was some tension and hissing at first, but now they’re mostly curious. they haven’t played together yet, but i think they’re getting there. he is of course named after tim burton’s stop motion animated character, vincent, who wants to be like vincent price. by the way, if any of you haven’t noticed that november is wovember, i suggest you get informed right now! more about it here.